Marcus C. Evans, Jr., was born on the South Side of Chicago and raised by his hardworking teenage mother. He is a proud Chicago Public Schools graduate, having attended Jesse Owens Elementary School and Morgan Park High School. While growing up, Marcus developed a passion for helping others and engaging with people, participating in a variety of community volunteer activities with his schools and church. At the age of 17, during his senior year of high school, Marcus met former Cook County Board President John H. Stroger, Jr. This meeting inspired him to get involved in politics, so he immediately joined President Stroger’s 2002 re-election efforts as a general volunteer and signed up as an assistant precinct captain with the 8th Ward Regular Democratic Organization. After graduating from high school, Marcus continued his political involvement taking roles in the Young Democrats of Cook County and the 8th Ward, while working part time at the Chicago South Target at 87th Street & Cottage Grove, and attending Chicago State University. Marcus worked on a variety of campaigns throughout the county on all levels of government and was mentored by a variety of political leaders. Marcus’ plans for productivity were in motion; however, life threw a major stumbling block in his path. After high school, a once minor breathing issue progressed into a major problem. By the age of 20, Marcus could barely breathe and began to feel hopeless after being told by doctors that he had no serious ailments. Determined to fight for his life, with no insurance and seeking real answers, he tried one last effort entering Saint Francis Hospital (now Metro South Hospital). The next day on July 31, 2006, after the doctor’s initial doubt, a test revealed that Marcus was suffering from cancer. Marcus underwent major surgery and endured months of outpatient chemotherapy treatment, but made it through as a survivor. Determined to get back on his feet and unable to sit idle at home, Marcus, not yet fully recovered, and against the wishes of some loved ones, started back volunteering and campaigning. One month after major surgery, Marcus was hired by the new 8th Ward Alderman Michelle A. Harris as a full time staff person, and he worked tirelessly serving the residents of the 8th Ward community from 2006 through 2012. In 2008, as Marcus was adjusting to a normal life after his tumultuous health experience, he felt a reoccurring need to do something to help others. After watching a commercial at home, Marcus called the American Cancer Society and began volunteering in the fight against cancer. Starting in 2008, he joined the American Cancer Society’s Cancer Action Network as an Action Leader for the 1st Congressional District. In this role, he traveled to Washington, D.C. annually to advocate for cancer research funding and healthcare for families across the nation. Meanwhile, Marcus continued to remain civically involved in the community. 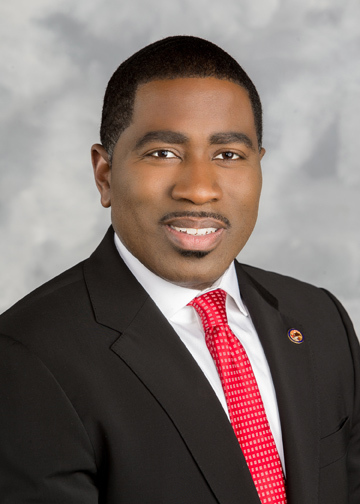 In 2012, after the retirement of State Representative Marlow H. Colvin, the committeemen of the 33rd District led by 8th Ward Committeeman Harris selected Marcus as a replacement. Marcus was sworn in April 13, 2012, and immediately began to work hard in Springfield to earn the trust of the community. As State Representative, Marcus has supported, sponsored and passed a variety of impact legislative measures focused on increasing economic growth, advocating for middle class working families and seniors, access to healthcare, and quality education for our children. As a way to bring awareness and advocacy to the forefront and share his experiences within the General Assembly, with the passage of HJR 54, Marcus helped to create the Illinois Legislative Cancer Caucus. Currently, in the Illinois House of Representatives, he chairs the Committee on Transportation: Regulations, Roads and Bridges where he looks to improve our state’s infrastructure and overall economy. In addition to Transportation Marcus also serves on the following committees: Transportation: Vehicles & Safety, Business & Occupational Licenses, Public Safety-Appropriations, Executive, Revenue & Finance and Tourism, Hospitality & Craft Industries. Additionally, he serves on one Illinois board, the Illinois Sentencing Policy Advisory Council. Outside of public service, Marcus works as a licensed real estate appraiser and an Illinois High School Association licensed basketball official.